Just this week we have completed the exterior walls to the roof level of Building D. Plumbing and electrical work is complete to the same level. Steel and materials have been delivered for the next phase which begins shortly. 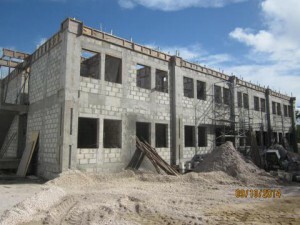 All the long lead items have been ordered and delivery dates established that will work with the construction schedule. The roof should be complete by October 15th, 2014.